Shares of Apple could climb north of $250 a share, led by its robust Services business. Last week, the king of kings reported earnings when Apple Inc. (AAPL - Get Report) released its fiscal fourth-quarter results. I won't go through the top takeaways, because TheStreet's tech guru Eric Jhonsa already did that. But despite beating on earnings per share and revenue expectations -- growing the latter by almost 20% year-over-year -- Apple stock has tanked on lower-than-expected guidance and the company's decision to remove unit sales from its report. Investors view this as muddying the transparency waters, and they're not wrong for feeling that way. However, this is Apple's way of telling investors that the metric is no longer that important. Case in point, consensus expectations for iPhone sales last quarter stood at 47.5 million units. Selling "just" 46.9 million iPhones was a slight miss, but how about an average iPhone selling price of $793 and iPhone revenue of $37.2 billion crushing expectations of ~$751 and $35.6 billion, respectively? Unit volumes aren't relevant and this is Apple's way of saying it. Further, Services is beginning to play a much larger role. The unit hit $10 billion in revenue during Q4, growing 27% year-over-year. For the Patrick Star-esque investors who live under a rock, we're talking about a segment with an annual run rate of $40 billion growing north of 25%. Remember, this is the segment that investors used to critique as "too small to move the needle." Well, how about now? These high-margin revenues are helping to drive both top and bottom line growth, and it's one reason why well-respected analyst Katy Huberty of Morgan Stanley raised her price target Thursday morning. While maintaining her buy rating, Huberty bumped up her price target to $253 from $226, implying more than 20% upside from current levels. In fact, the average price target on Wall Street sits up near $237, implying almost 15% upside from here. Huberty argues that Apple's Services unit has a long runway and should sustain 20% or more annual growth and continued margin expansion. I think of Apple sort of like the razor/razor blade business model. But instead of giving away the razor to bank on blade sales, Apple's razor -- the iPhone -- has made Apple into one of the most valuable companies in the world. This expensive piece of equipment serves as the gateway to a Services unit that is an absolute cash cow. If investors can't recognize that, they haven't been paying attention. Apple a holding in Jim Cramer's Action Alerts PLUS member club. Want to be alerted before Jim Cramer buys or sells AAPL? Learn more now. What are the charts telling us? So far the backside of its prior uptrend resistance (blue line) is holding as support. Should that give way, we'll likely see the post-earnings low and perhaps a drop down to the 200-day moving average. 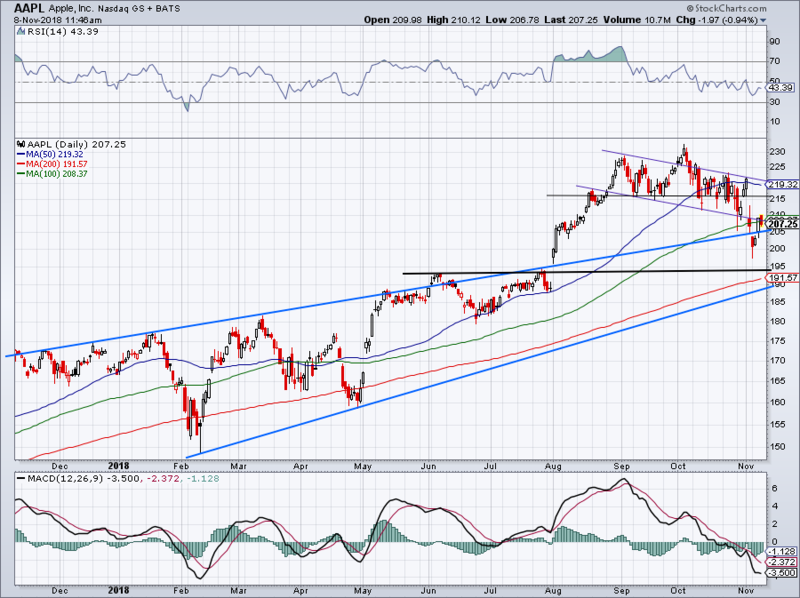 In the low-$190s, Apple should have plenty of support, at least on its initial test of this area. On the upside, Apple has to get above its 100-day moving average and back above channel support (purple line). It will also have to contend with the $216 level that acted as support all through the October swoon. Above that and the 50-day moving average and channel resistance loom near $220. To say it will be an easy road is a lie, with the exception being a monster rally in the Nasdaq that launches Apple higher now that we're past the midterms. Traders buying now may see a lot of chop in Apple before the stock decides which way it's going to go. But investors shouldn't hesitate about taking a few bites of Apple down here and adding on a further dip to support.